MoneySavingExpert.com and Which? have submitted a joint letter to the financial regulator expressing "serious concern" at media reports it's considering introducing a time bar on PPI complaints. 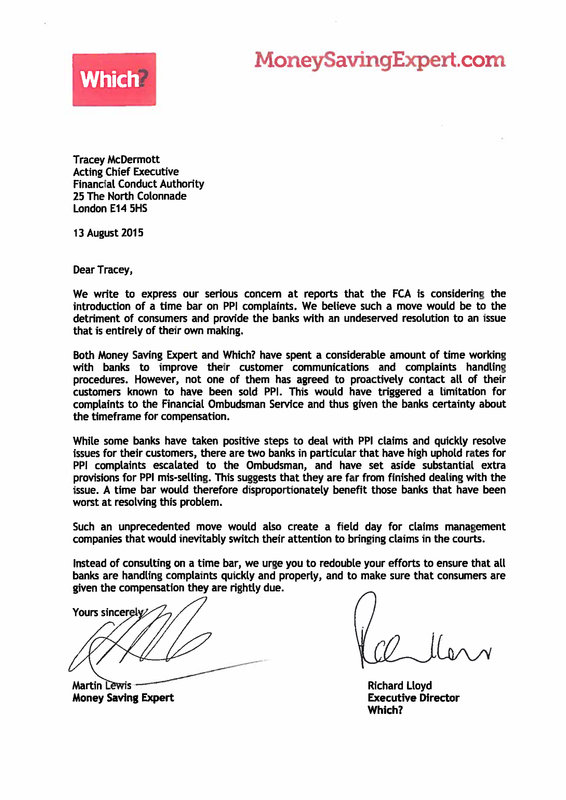 Our founder and editor, Martin Lewis, and executive director of Which?, Richard Lloyd, state in the letter to the Financial Conduct Authority (FCA)'s acting chief executive, Tracey McDermott, that such a move "would be to the detriment of consumers". Adding that it would "provide the banks with an undeserved resolution to an issue that is entirely of their own making". Instead, we urge the FCA to "redouble" its efforts to ensure all banks are handling complaints quickly and properly, and to make sure consumers are given the compensation they're rightly due. If there's a chance you're owed, urgently check now. You can do this yourself, for free, using MoneySavingExpert.com's Reclaim PPI guide. We argue that while both ourselves and Which? have spent a "considerable amount of time" working with banks to improve their customer communications and complaints handling procedures, disappointingly not one has agreed to proactively contact all customers known to have been sold PPI. We also state that a time bar would disproportionately benefit the banks that have been worst at resolving the PPI problem. Barclays and Lloyds in particular have high uphold rates for PPI mis-selling, although some banks have taken positive steps to deal with PPI claims. Further, we warn that such an unprecedented move would create a field day for claims management companies that would inevitably switch their attention to bringing claims in the courts. Martin adds: "In 2007 we warned people who wanted to reclaim bank charges to act soon – months later a hold was imposed that was never lifted. I believe we may be getting close to a similar situation with PPI now. "Over £20 billion has been paid out, and banks have made provisions for billions more. For years they've been pushing hard for a deadline on PPI reclaiming. Previously, this anti-consumer move has seemed unlikely to be enacted, but with changes at the top of the regulator, the FCA, there are mutterings it could now happen. "Therefore, if you think you are owed PPI or you have never checked, do it now. Even if you rejected PPI when you got a loan, credit card or mortgage, in some cases it was added anyway – that's how rampant the mis-selling was – so many people who think they're not entitled to cash are. "And remember, you don't need to use a claims management company that would take 30% of what you're owed – you can do it yourself for free using templates on MoneySavingExpert.com or Which?. "They've dirtied the name of PPI reclaiming. So much so some people may like the idea of a deadline to stop the spam calls – yet we should tackle that in its own right, if PPI does end they'll just move to a new subject." Just click the letter image below to enlarge it.